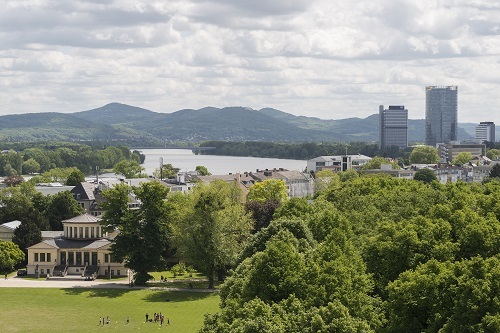 This page will provide you with practical information and important links to help you plan and prepare for your time as a student at the University of Bonn. For general information regarding the necessary formalities before and after your arrival in Bonn and concerning accommodation, language courses, etc. please see the homepage of the International Office. The International Office is at the very centre of the University of Bonn's international exchange activities. 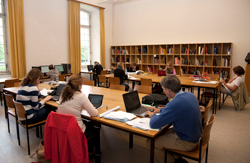 It provides support and advice to international students enrolled at the University of Bonn as well as to those interested in studying here. It also runs the so-called "International Club", a perfect place to meet German and international students, which offers a wide range of activities, such as excursions, discussion groups, film nights and theatre visits. The International Office also offers a wide range of German language classes at different levels in order to help you prepare for your studies or to improve your German while enrolled at the University of Bonn. 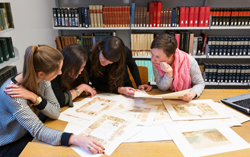 Plus, you find important information on the Erasmus website of the University of Bonn. "Trascorrere un anno da studentessa universitaria presso il Kunstgeschichtliches Institut dell'Università di Bonn è stata per me un'esperienza formativa e di crescita sotto molteplici punti di vista. Provenendo da un'università in cui il metodo di apprendimento si attiene prevalentemente allo studio mnemonico, è stato per me qualcosa di nuovo e non facile fatto il dovermi cimentare nella stesura di Hausarbeiten. Sono tuttavia grata di averlo dovuto fare, in quanto ho imparato come "scrivere" un lavoro universitario, cosa di cui prima non avevo idea. Ho molto apprezzato inoltre l'atmosfera piacevole dei corsi, i quali sono composti in linea di massima non da pochi studenti. Mi è molto piaciuta inoltre la possibilità data a tutti gli studenti di interagire e confrontarsi direttamente con i professori e docenti, e ho trovato molto interessanti le numerose manifestazioni organizzate dall'istituto, grazie alle quali ho imparato nuove cose e conosciuto nuove persone. Ho potuto grazie ai corsi inoltre (tenuti esclusivamente in tedesco) migliorare decisamente la mia conoscenza della lingua tedesca." "Meine Erfahrung am Kunsthistorischen Institut Bonn dauerte zwei Semester, es war wunderschön und prägend. Ich hatte viel Spaß an der Methode, die ich im Studium fand. Die Teamarbeit, die Referate, die Hausarbeiten, die Exkursionen haben alle meinem Studium neue Kompetenzen beigefügt, die ich in meiner Heimat nie ausprobiert haben würde. Ich habe viel Freundlichkeit gefunden von den Professoren und Kommilitonen. Die Sprache war manchmal ein Problem, aber hier bin ich mit meinen Fehlern im Deutsch-Schreiben! Es gibt viele Momente, die ich mit dem KHI verbinde. Viele Veranstaltungen, Seminarstunden, Kaffeepausen, Blicke auf das Poppelsdorf Schloss mit dem Schnee im Winter und der Sonne im Sommer. Aber den ersten Besuch im Institut werde ich nie vergessen. Meine Erasmus-Kommilitonen und ich hatten unseren Coordinator im Hof gerade kennengelernt. Wir haben zusammen eine Tour durch das Institut gemacht. Am Ende der labyrinthischen Tour ließ er uns mit zwei deutschen Kommilitonen in einem pittoresken Archiv. Es war ein sehr enges Zimmer in Holz auf zwei Etagen. Ich habe dieses Zimmer nie mehr gefunden. Es war wie in Hogwarts. Unsere deutsche Kommilitonen haben eigenes Bier aus einem kleinen Abstellraum herausgeholt. Es war das beste welcoming ever!" “The University of Bonn is a special place. Looking like a fairytale palace from the outside, it received an 'Engländerin' with a sporadic grasp of the German language in with open arms from my very first day in the Art History department. From the 'Kunstgeschichte Kneipentour' that never left the first 'Kneipe', to book sales, trips to Frankfurt, and hours spent studying in possibly the most beautiful library in the world, I felt myself welcomed and included in all aspects of student life. My only advice to future exchange students is to get fully involved: take courses on anything and everything that looks interesting, join in with student activities, and worship the librarians- they know more than one could possibly imagine. Record the lectures so you can understand the jokes made in class the second time you hear them, and however terrifying class presentations in German may seem, know that everyone in the room is willing you to succeed. And don’t try and study during 'Karneval'. It might be the only time of year when every desk in the library is free, but you may be chased from them by a librarian unexpectedly dressed as a pirate. Enjoy Bonn. It may be 'klein', but it is certainly 'fein'." "The Art History Department offers various opportunity for the Erasmus+/foreign students, who are interested in art, art history, art theory. I chose especially the lectures related to the 20th century and contemporary art. I took part in a seminar and got familiar with the local art scene. I also enjoyed the additional programs on this department, for example art gallery guide tour in Cologne, art history ‘Stammtisch’ in Bonn. Moreover the art history department has an unique library, with constantly expanding collection and the most beautiful and unforgettable view from the reading room to the Hofgarten." “Das Studium an der Universtität Bonn würde ich jedem auf jeden Fall empfehlen. Mein Erasmussemester habe ich sehr genossen. Sowohl das Studium als auch Bonn und seine Umgebung haben mir sehr gut gefallen. Das Kunsthistorische Institut bietet viele interessante Kurse an und die Uniräume sind sehr gut ausgestattet. Die Professor*innen und Mitarbeiter*innen der Universität waren alle sehr freundlich, immer hilfsbereit und hatten einen guten Kontakt zu ihren Studierenden. Die wichtigste Sache fand ich aber, dass die Lehrenden für die Anregungen der Studierenden und Diskussionen offen waren. Man konnte also nicht nur sein Wissen ergänzen, sondern auch über das eigene Denken kritisch nachdenken. An der Uni, die eine multikulturelle Atmosphäre hat, gibt es regelmäßig stattfindende kulturelle Studierendenveranstaltungen. Der Aufenthalt in Bonn war eine einmalige, wertvolle Erfahrung, welche mir in meiner persönlichen und beruflichen Entwicklung viel geholfen hat." "I have spent a semester at the Institute for Art History and I completely felt like one of the regular students. I was dealt with care but my tasks were equal to the others, which made me push through my boundaries: prepare presentations and write essays in German language. The course selection is quite big, so it wasn't a problem for me to find seminars or lectures which fitted my area of interests. My most outstanding experience was an excursion to the Bauhaus cities, where I also had the chance to connect with other students in the inspiring environment. I highly recommend checking out the surrounding cities in North Rhine-Westphalia (NRW) for amazing art institutions and exhibition spaces, but Bonn and Cologne itself have a lot to offer, including the magical university library or the one at Museum Ludwig."